There was lots of silver through these mountains and the place was prosperous. 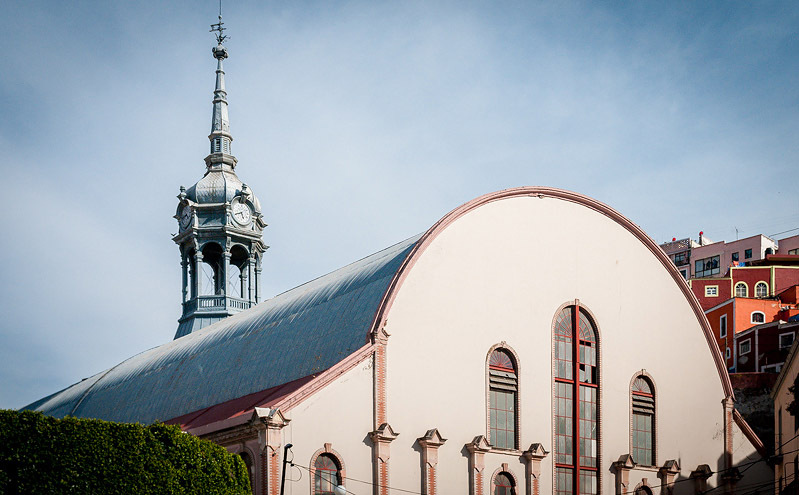 The colonialists had lots of money to throw into lavish churches and haciendas. Life was good for the mining tycoons and Spain was enjoying its cash cow, for awhile delivering almost half of the supply of silver in the World. The locals got poorer and poorer. Spain got greedy and even the Mexican-born Spanish population got fed up. Independence movement was on its way. 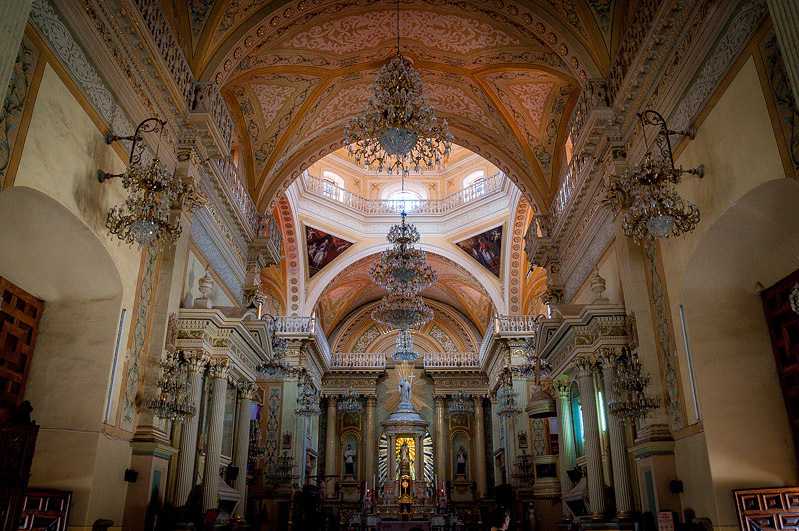 In 1810 priest Miguel Hidalgo rang the bells of his church in Dolores, not far from here, and called the people of Mexico to revolution. 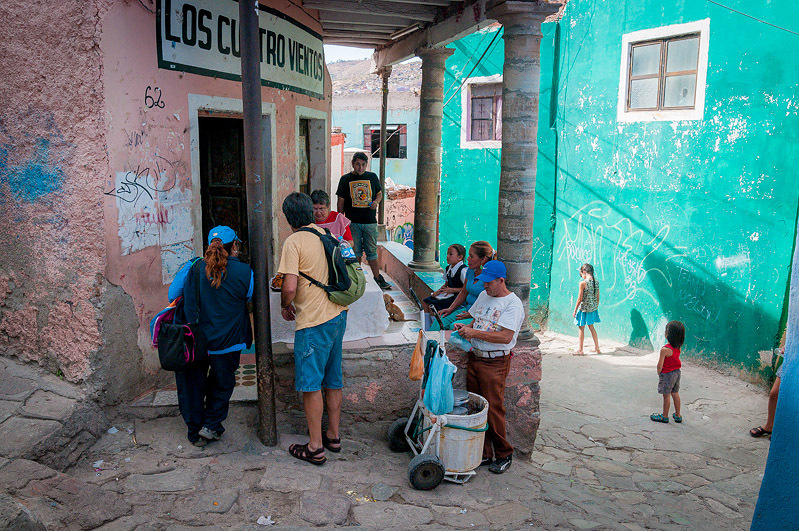 With a bunch of people he descended onto Guanajuato. After fierce fighting, they managed to get into the very new granary building, that was now used as a make-do fortress, and killed the few hundred men, women and children that were hiding in there. So was marked the first battle for independence. History is flawed that way. It relies heavily on the person that tells it and flexes easily under the pressure of prejudice and personal interests. Nowadays it is used mainly to instill national pride, keep hatred alive, and of course, to draw tourist crowds. 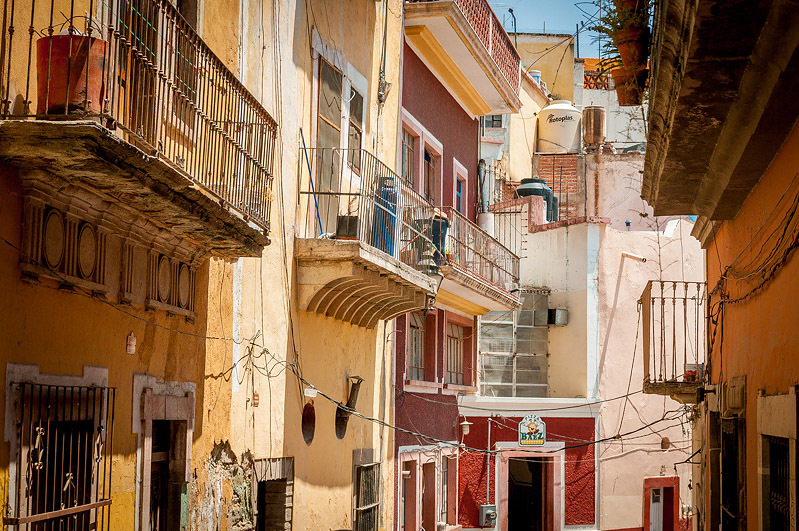 Guanajuato is charming all on its own. I think just the colorful houses climbing the hills are enough to warrant a visit. The Cathedral is another popular stop. Notice the chandeliers, a new feature for us, almost sparking a bit of excitement in our europe-church-exhausted senses. Market with a clock tower designed by Eiffel? Sure, come right here. Old channels that used to guide the rivers and streams through the town are now freed to foot and motorised traffic by the dams high in the mountains. 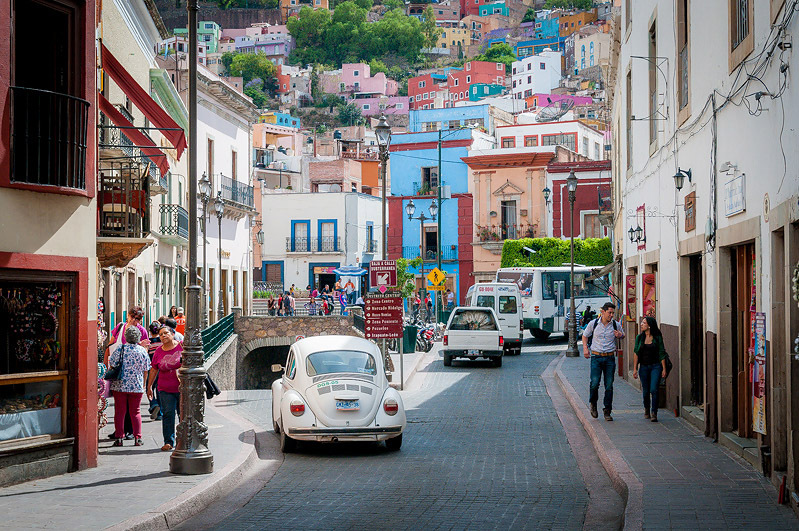 and you have done Guanajuato, the famous tourist destination. 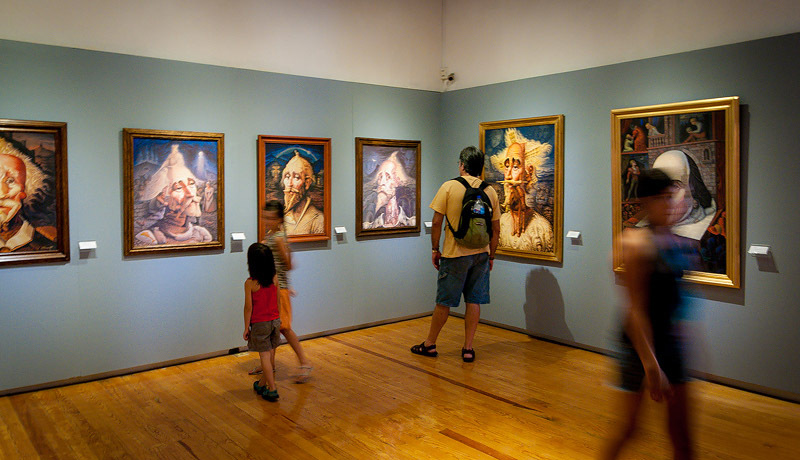 History is here, supported by museums, legends and enough tourist attractions to keep people coming. 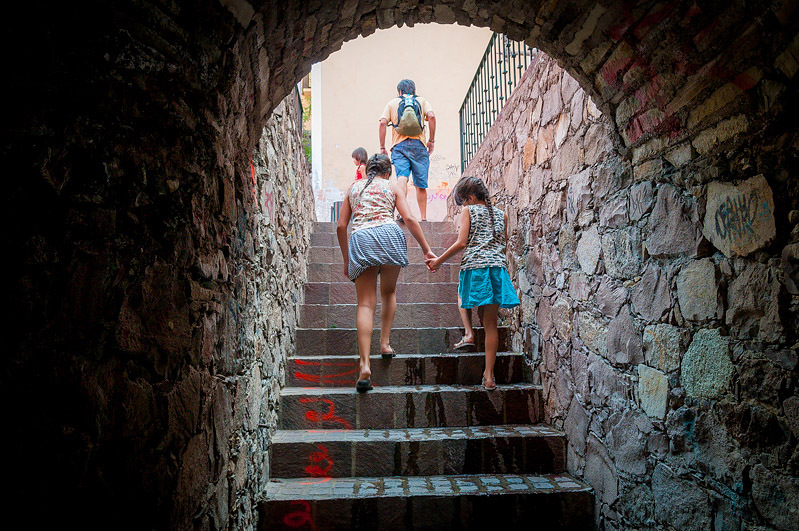 Here is what was fun in Guanajuato. 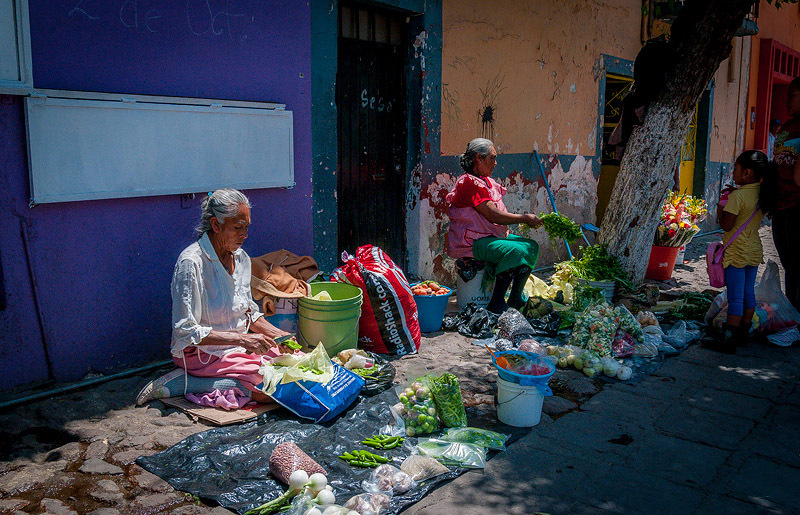 Walking by the old women, who sell fresh produce every day just outside of the tourist hub. We stocked up on new warm batch every day – less than a buck. 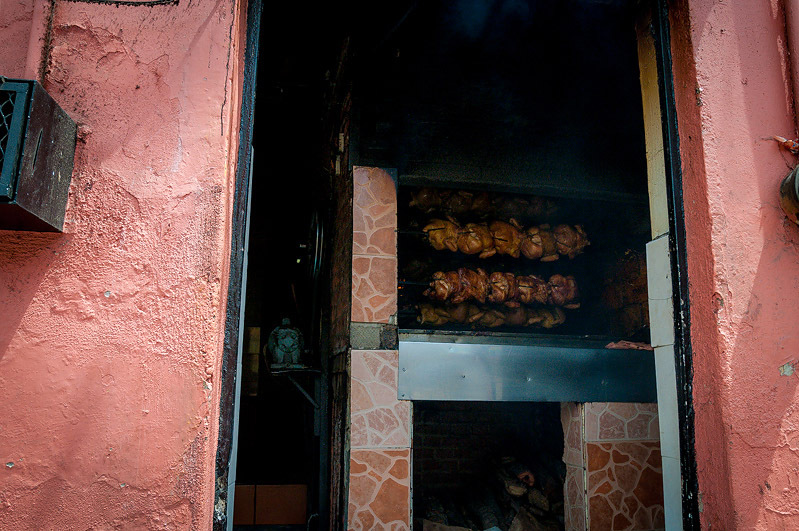 The buzz of overcoming the apprehension of squeezing through the small smokey entrance, almost plugged closed by the roasting chickens over hot coals, to find out what is hiding behind it – a smokey space, where an elderly man swiftly cut up a chicken for me and loaded a bag full of it along with salsas, rice, roasted poblanos and coleslaw-looking cabbage. 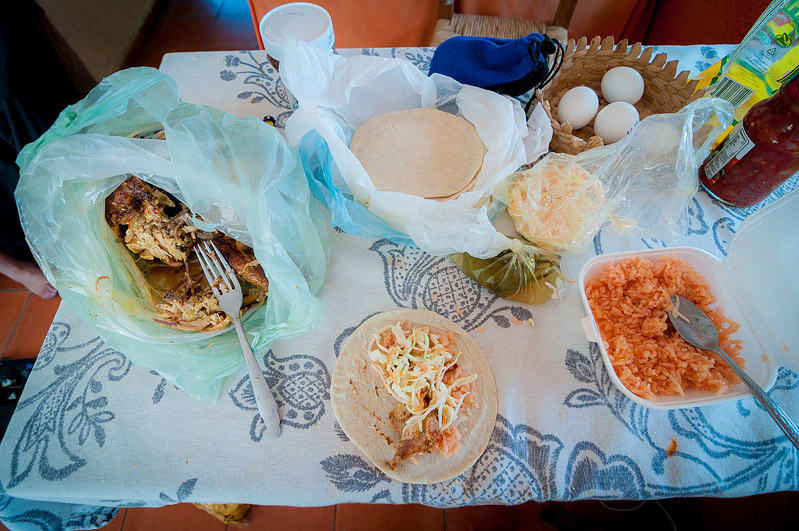 And afterwords combining the tortillas with the contents of the bag to deliver a delicious lunch for the family with greasy fingers and a big smile. Hiking up and down the back alleys of the city, peaking through open doors and reading fading notices, was another highlight, especially the laughter we shared with an elderly woman after Mr.Blab offered to carry her bags up the street and it turned out that her hesitance was because her house was 3 doors up. 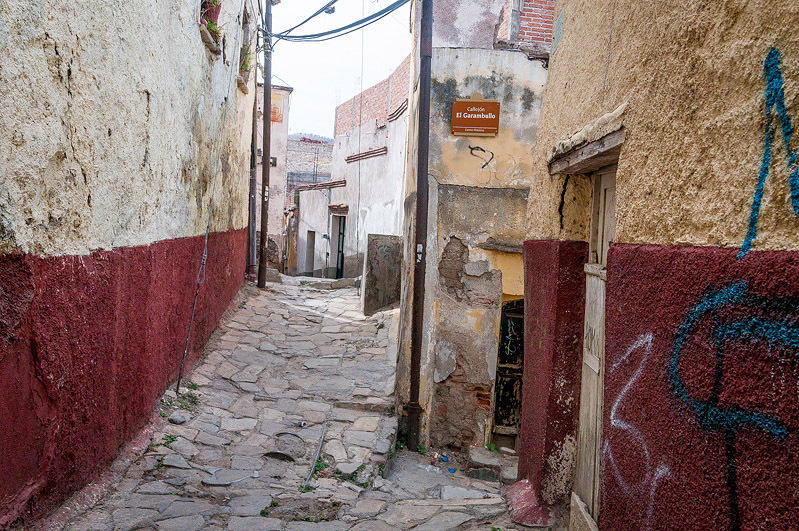 Very little shine and glamor in those alleys, but so much character and opportunity to discover something for yourself. 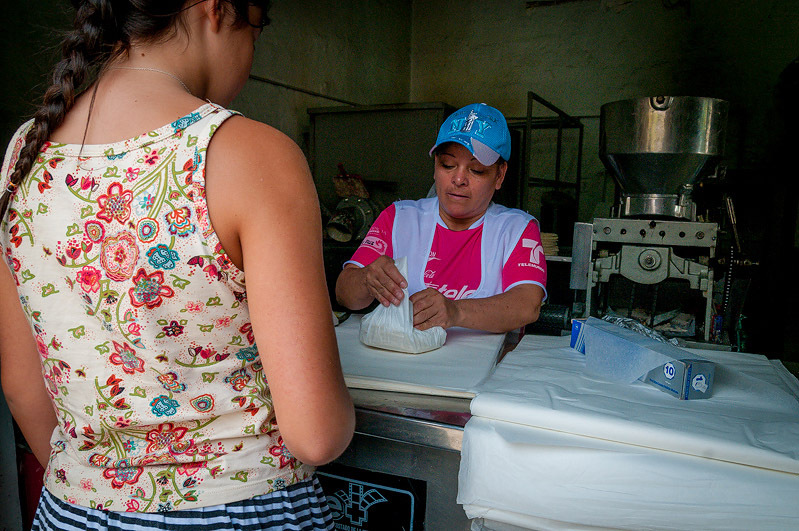 Like a small corner delivering homemade corn breads? 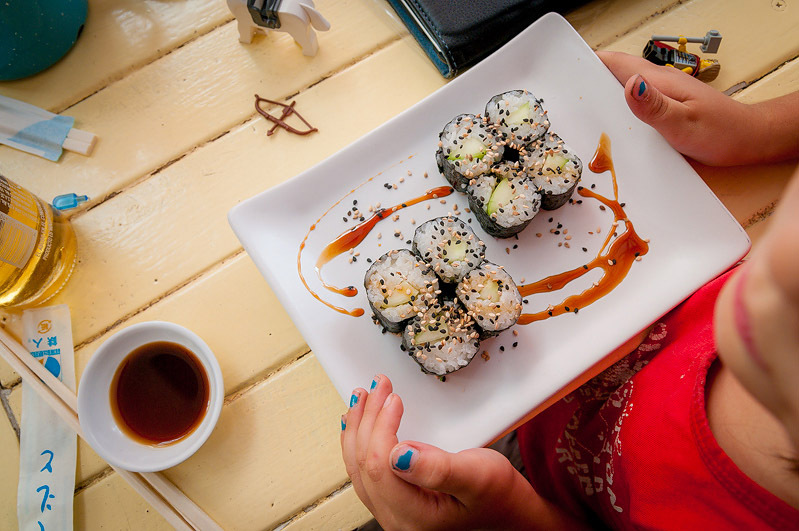 Celebrations and squeals accompanied the discovery of a good sushi place in one of the alleys in the historic center. And anyone that has tried to find this rare beast in Mexico can truly appreciate the significance. I doubt we will forget also the woman carefully picking bees from the fruit stand like they were delicate flowers and collecting them in a bag. For “therapeutic” purposes, she said, showing me a sting sticking right in the middle of a slightly red area on her hand. And certainly, not lastly – Jose. 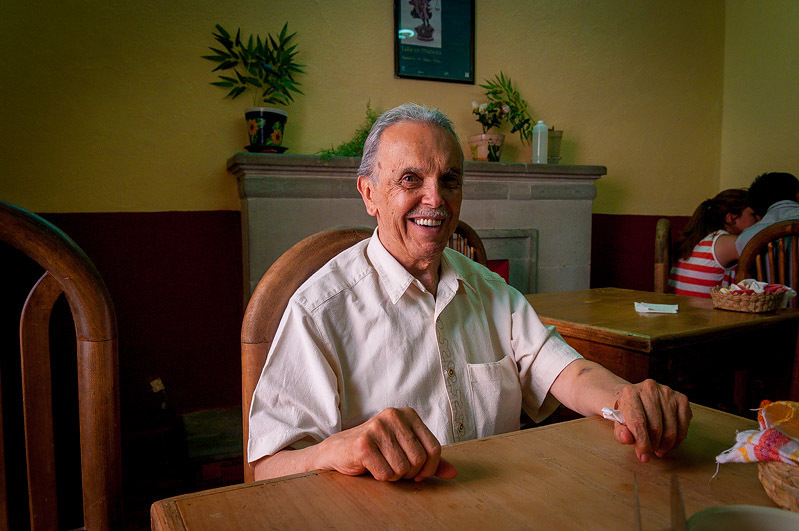 I struck a conversation with him in a little eatery selling “menus of the day”, quite economically, as the woman at the Diego Rivera museum told me. The food was cheap, but the company was priceless. We talked moles, gorditas, about his travels around Europe, his retirement home and unwillingness to accept that this is it for him. He was slightly disappointed by his green mole, while I was too busy soaking him in to not enjoy mine. 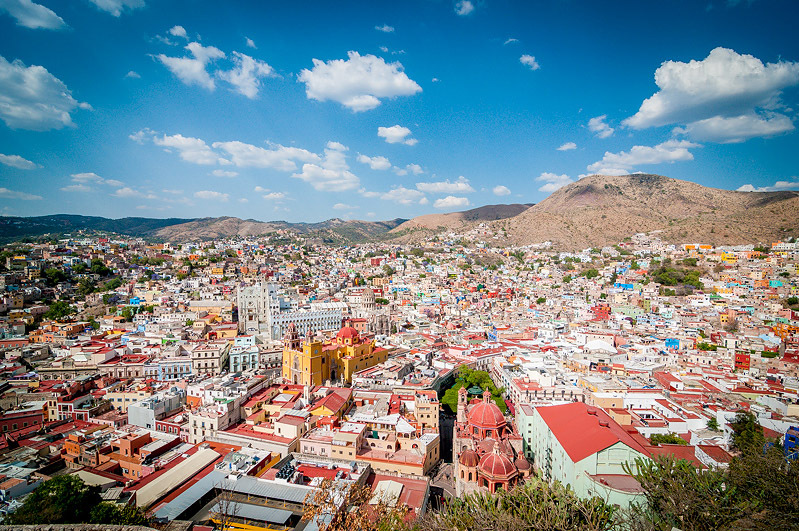 Guanajuato may be one of the jewels of the traveling crown that is Mexico. It may hold an important place in the history that is told in various forms here and there. But what made it interesting for us were, yet again, the unassuming details lurking on the streets and behind the opulent buildings. We managed to touch at least a little bit of the pulse that keeps the place going today, not hundreds of years ago. 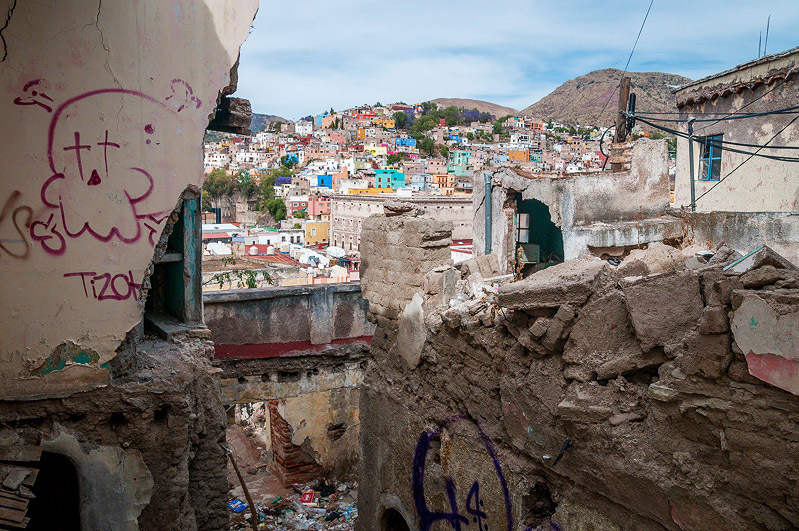 From now on, Guanajuato will not be precious to us. It will be very real, familiar and endearing instead. 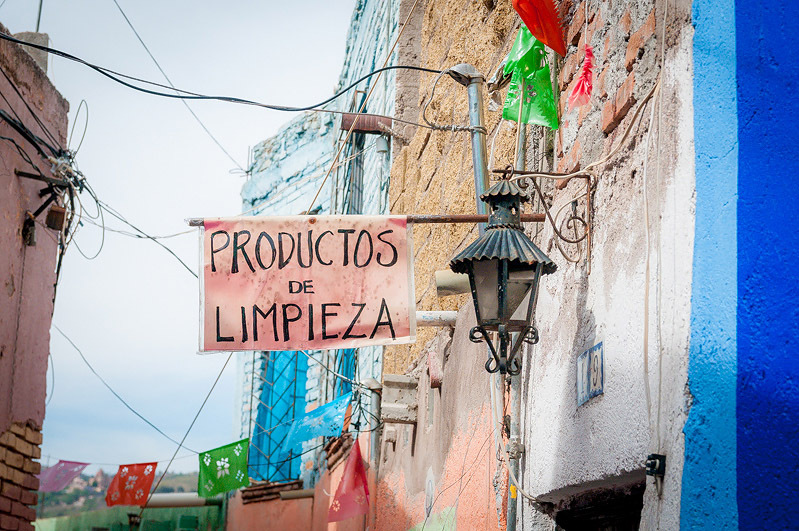 I think this must be a sign that Guanajuato is calling us, this is the second post about it today! 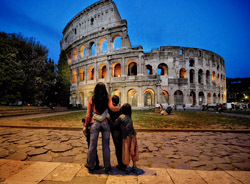 Hecktic Travels are also there and posting some beautiful pictures! Hmm, where can I fit this into the travel schedule?!?! This area is full of interesting destinations, so well worth coming and exploring. If you go there again, let me know and I will guide you to it. What a treat! A real, full length blog entry. Love your pictures, as always. Keep them coming! Love the pictures. 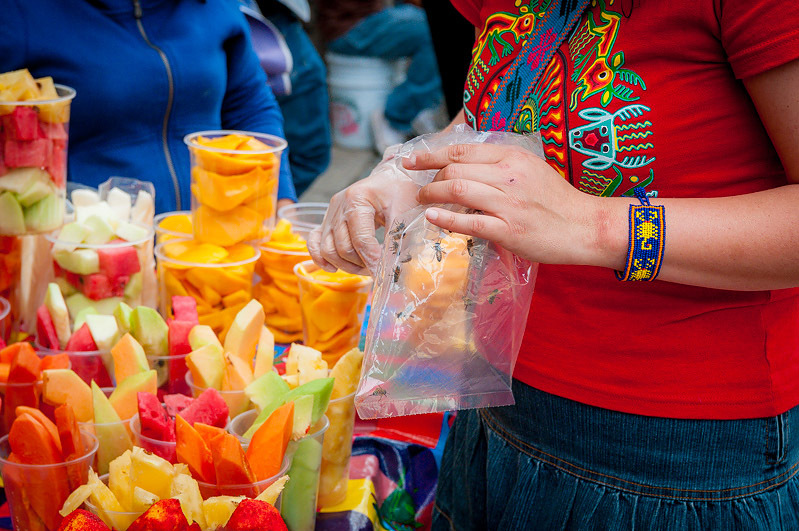 Must add this to the long list of places to visit in Mexico. 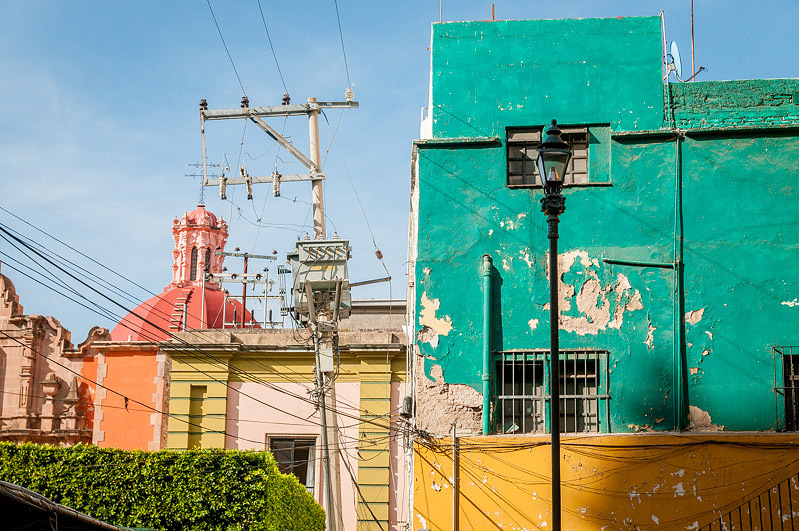 Guanajuato is on our list of cities to hit on our border run next month as I’ve heard many great things from various ppl, but I really like your pics of the colourful buildings; that was such a pleasant surprise. Fun and cheery. This is really well written and the photos are amazing! 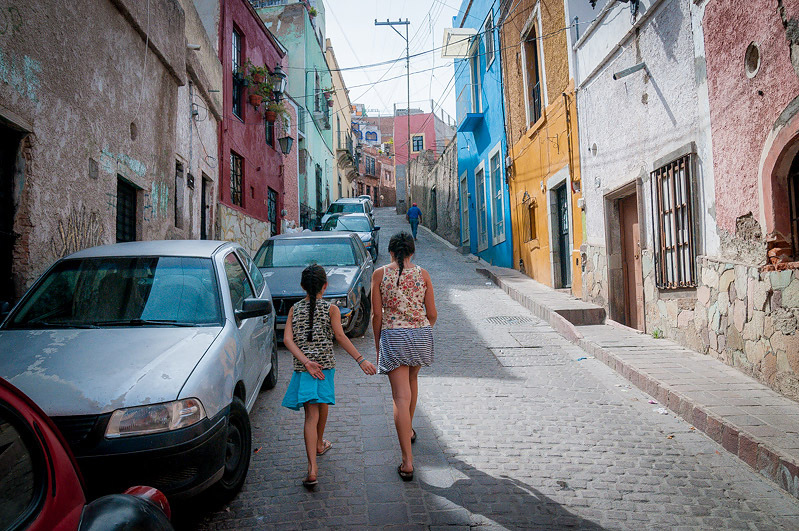 Seems like you saw more of Guanajuato in a few days than I did in five weeks!!! My mouth is watering for that food, it look delicious! 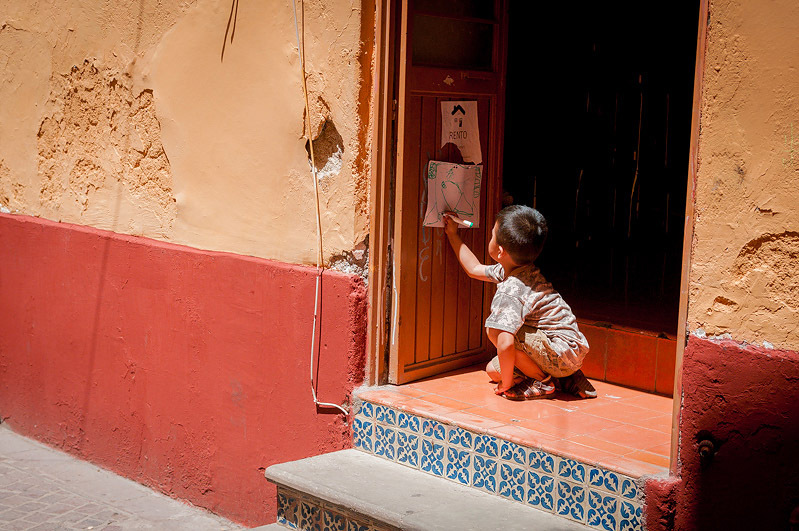 Thanks for sharing all the small details that truly make a Guanajuato special. 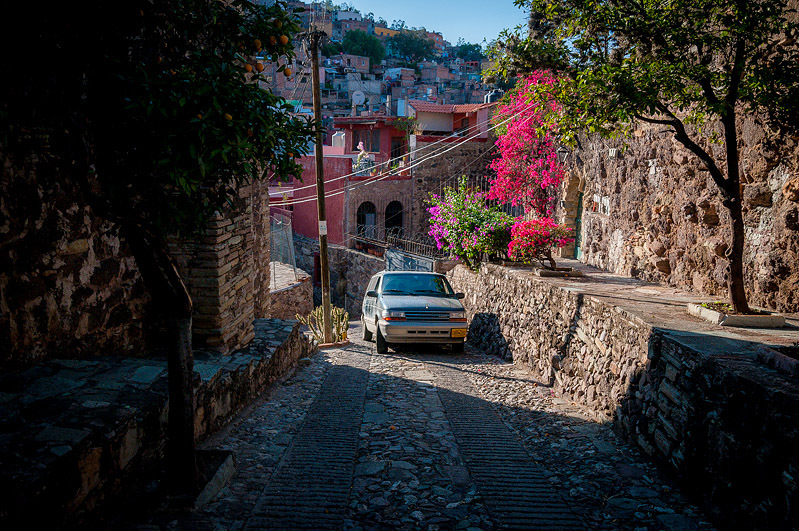 I’ve only learned about Guanajuato a few weeks ago, and instantly fell in love with the town..well, at least with the photos. It seems like the local government did a quite good job in preserving the Spanish colonial buildings while at the same time using what they’ve got for the benefit of its residents. 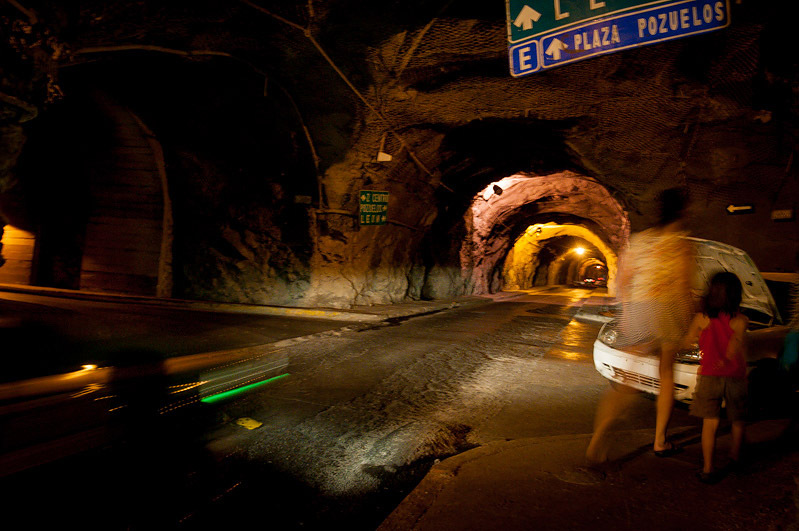 That tunnel for example. And who would’ve thought of finding a sushi restaurant in the back alleys of the town! Hola! 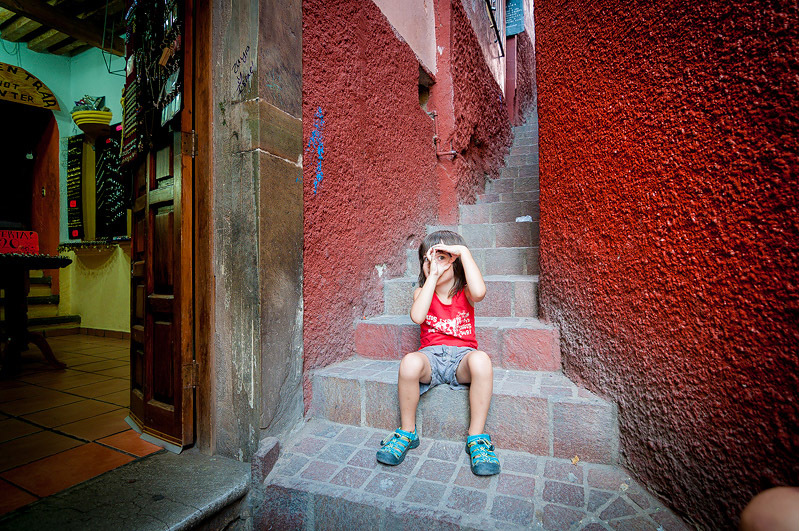 I fell on your blog when searching on Guanajuato and I love it! We are now in this beautiful city and we enjoy it! I just have a question: we are looking for a good homemade corn bread to buy! I can’t find anything and can’t guess where your photo has been taken. Would you remember the name of the place and the street, by any chance? Muchas gracias! 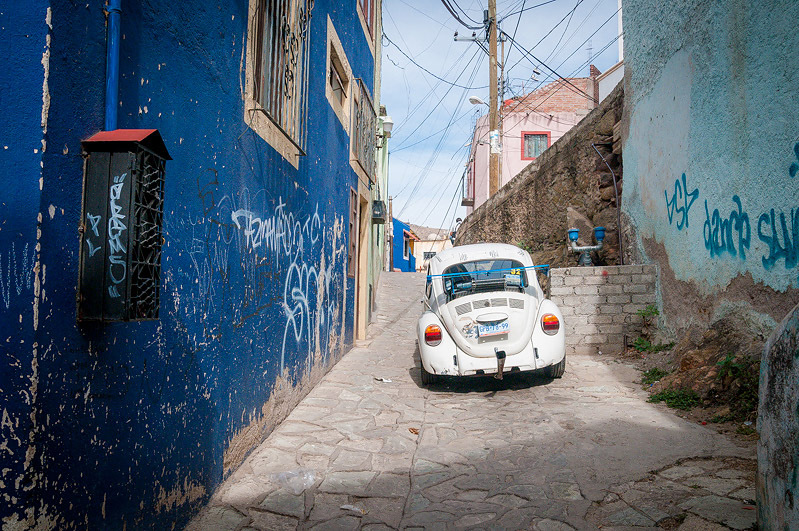 Charlotte, I am a bit jealous you are in Guanajuato. Such a fun place. As far as the corn breads…I had a look on the map trying to find out where it was, but I cannot find the spot. We walked through the high streets on the South side of the main street. We climbed up, up, up and then on the way down we stumbled on that lady. My best advice is to ask around. 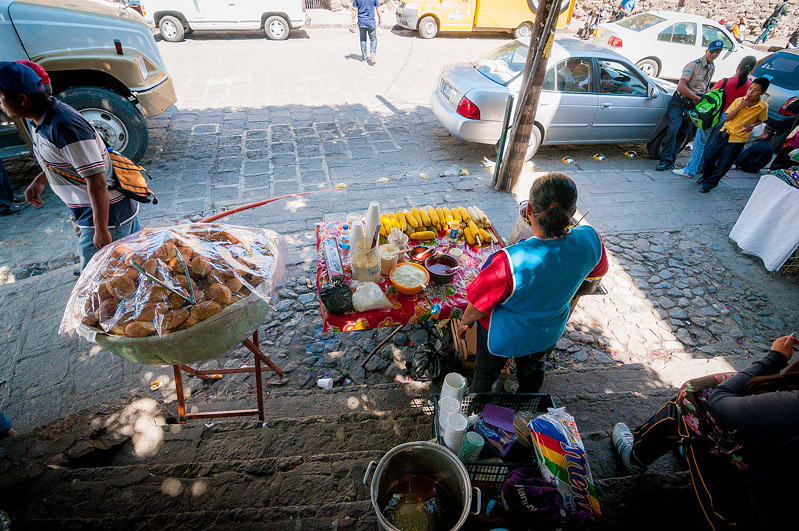 The women come out in the late afternoon selling homemade stuff all around town.